Comprising small, medium and large sizes, the Stellar pendant lamp collection is inspired by stars as seen through a telescope. 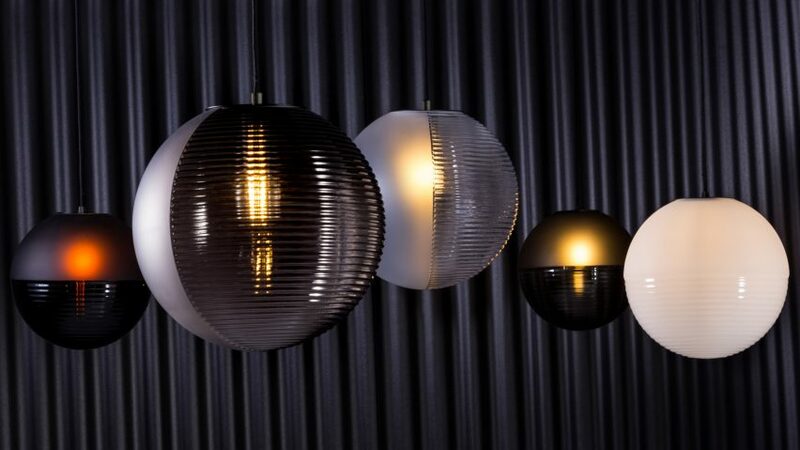 Each lamp is composed of two translucent handblown glass hemispheres that are joined either horizontally or vertically. While one half is sandblasted to create a smooth frosted finish, the other features clear curved ridges that are designed to recall the surface of the moon. Describing the lamps as "simple forms that utilise the ability of glass to distort and reflect", Pulpo said that the bubbles, streaks and other variations in size and colour that can be seen in the glass are all part of handmade production processes. Herkner has a longstanding relationship with Pulpo, which has seen the German designer create over 12 products for the brand to date. Among his previous works are more handblown glass products, such as the Oda table lamp and the Containers series – first launched in 2013. The Stellar lamps form part of Pulpo's Crystal Collection, which will launch at the IMM Cologne and Maison&Objet trade shows this month. The lamps are available in clear, white, smoky grey and aubergine colourways.